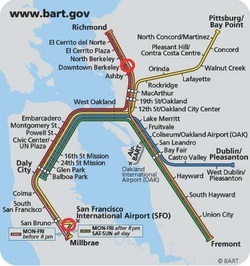 BART operates rapid rail service to Berkeley from SFO. The SFO BART Station is located on the Departures/Ticketing Level of the International Terminal (Boarding Area G side). BART is easily accessed from any terminal by riding SFO's AirTrain to the Garage G/BART Station stop. Take the Pittsburgh/Bay Point Line to 19th St/Oakland, transfer to the Richmond Line, and exit at Downtown Berkeley. Departures/Ticketing Level from the roadway center island at all terminals. Taxis depart from the designated taxi zones located at the roadway center islands, on the Arrivals/Baggage Claim Level of all terminals. AirBART shuttle travels between OAK and the Coliseum/Oakland Airport BART Station every 10 minutes during the day. Fares for AirBART are $3.00. The AirBART shuttle trip takes approximately 15 minutes. It stops in front of the Coliseum/Oakland Airport BART Station on San Leandro Blvd. and in front of Terminal 1 and 2 (Southwest Airlines). From the Coliseum/Oakland Airport Station, take the Richmond Line to Downtown Berkeley. The AC Transit (bus) Line 73 connects OAK with the Coliseum/Oakland Airport BART station every 15 minutes between 4:56 a.m. and 12:06 a.m. Local bus fare is $2.10. shuttle, taxi, and limo service to and from Berkeley.